Zhongli Ding successfully defended her Ph.D. dissertation entitled "BayesOWL: A Probabilistic Framework for Uncertainty in Semantic Web" on December 5, 2005. (Photo) ZHong Li Ding Defends shows (Person) Zhongli Ding. 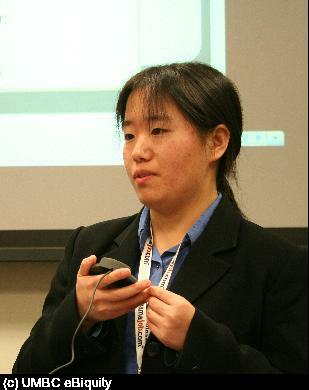 (Photo) ZHong Li Ding Defends was taken at (Event) BayesOWL: A Probabilistic Framework for Uncertainty in Semantic Web.